Arts is our final individual Trivia Crack category to analyze, and the seventh blog in our series. We’ll have two more blog posts after this where we look at total combined scores for all categories, so stay tuned! Arts is the bane of many a player, and is far and away the toughest category. Let’s take a look at scoring patterns in this realm of painting and literature. As usual, we gathered and analyzed the scores of over 400 random Trivia Crack players by participating in both one and one and group challenges. Here’s the distribution of scores that we developed. Arts is definitely the toughest category overall. It only takes a score of 59 to beat 25 percent of scores, and a score of 66 will put you in the top half of Arts contestants. This is much lower than we see in other areas. A score of 77 will put you in the 90th percentile, which is also the lowest of all the categories. At the top end of the scale, it only takes an 83 to land in the top 1 percent. So a lot of people are scoring lower in Arts than in other categories, and relatively few people also have high scores. 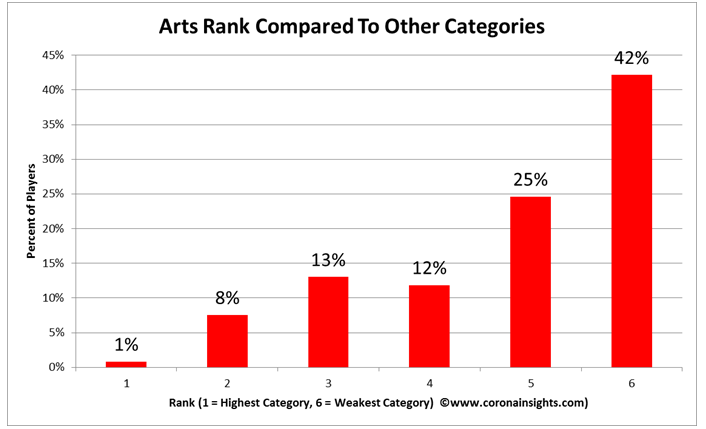 So how do Arts scores compare to other categories? On average, it’s players’ weak link of the six categories. Arts is the top category for only about 1 percent of players, and it’s the worst category for a whopping 42 percent. If Arts is your best category, you’re a rare species. If you’re good at Arts, does that predict that you’re a good overall player? And if you’re weak at Arts, are there other categories where you’re strong or weak? We did a correlation to test that analysis. We won’t reveal our analysis of total scores until our next blog, but we can look at correlations. First off, we should note that there’s a strong correlation between every category and total score. We would expect that, because your total score is just the sum of all of your individual category scores. 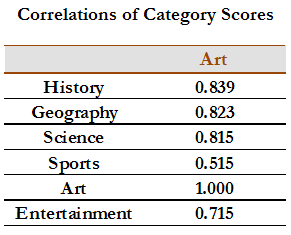 However, there’s a stronger correlation in some categories than others, and Arts is a pretty strong predictor of overall score. It has a Correlation factor of 0.899, where 0 means no relationship at all and 1 means that it’s a perfect predictor. This is the third-strongest correlation among the six categories, which means that your Arts score is a very good indicator of your total score. And what category most closely aligns with Arts? Another simple correlation analysis shows that the scores that run most closely in parallel to Arts scoring is Geography scoring, but it doesn’t particularly stand out among most of the other categories. What does stand out is the low correlation with sports scores. I guess you should expect to see a lot of people in hockey jerseys at your local art museum. 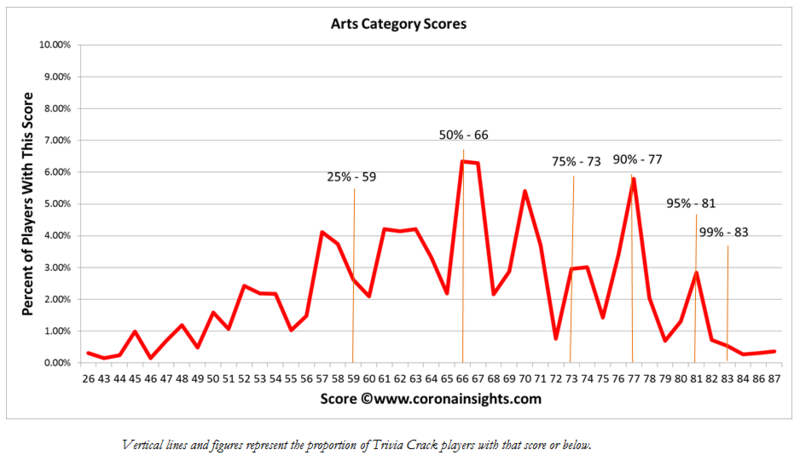 If you’d like to know exactly where you stand on Arts, here’s a chart that estimates the proportion of players who score at or above a particular score, based on our modeling. Now let’s finally take a look at the total scores.